Cao Bang Province is located in the Far North - East, shares borders with China on the north and east, Bac Can and Lang Son provinces on the south, and Ha Giang and Tuyen Quang provinces on the west. The topography is complicated so inter-transportation is limited. Cao Bang has temperate climate. There are 4 seasons: spring, summer, autumn, winter. The average temperature is 25 - 28oC in summer and 16 - 17oC in winter. Snow sometimes falls in winter on high mountains such as Trung Khanh, Tra Linh. The cool weather combines with many high mountains, beautiful sightseeing to form the convenient for relaxing tour and discovery tour. Famous sites include Thang Hen Mountainous Lake in Tra Linh, Ban Gioc Fall and Nguom Ngao Cave in Trung Khanh. 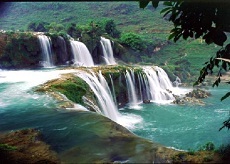 Among of them, Ban Gioc Fall probably is one of most beautiful waterfall in Vietnam. Several sites where Uncle Ho lived and worked before the August 1945 Revolution include Pac Bo, Coc Bo Cave, Lenin Stream, and Khuoi Nam Stream. In Cao Bang, the traditional festivals have specific characteristics of ethnic groups, for example, Long Tong Festival, Inviting the-Moon-Mother Festival (Moi Me Trang).